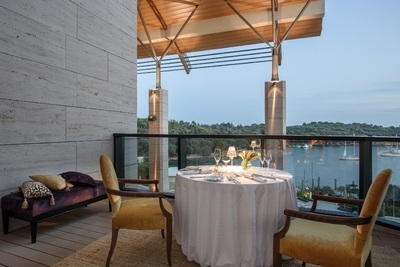 Located in Rovinj on the northern coast of Croatia, the Amatis restaurant is the only restaurant in Croatia where guests can enjoy a VIP dining experience by having the whole restaurant exclusively to themselves. The Amatis restaurant is located in a private area of the five-star Hotel Monte Mulini, where guests can enjoy beautiful moonlight views across the Lone bay whilst enjoying a romantic private candelit dinner for two. Perfect for any special occasion, honeymoon treat, or proposal, the two diners can indulge in a 5 course tasting menu designed and developed exclusively by UK chef Andy Gaskin, former trainee to Heston Blumenthal, with the assistance of Teo Ivansevi? and his team. Inspired by the local fishermen and farmers who provide the restaurant with the best local and seasonal produce, the menu is a real showcase of the ingredients that nature produces from the landscape of Istria, and is complimented by the local Istrian wine, in which the region is renowned for. For a truly unforgettable evening, the hotels’ signature concierge service are on hand to help with any specific requests to make the special occasion an experience to remember. The restaurant is open for dinner only and the 5 course menu at Amatis costs 540 kuna per person (approx £59) excluding drinks.